Supermarkets and hypermarkets are becoming more and more prevalent in China. A supermarket is a large form of the traditional grocery store: a self-service shop offering a wide variety of food and household products, organized into aisles. A hypermarket, on the other hand, differs slightly in that it is a superstore combining a supermarket and a department store. It is an expansive retail facility carrying a wide range of products under one roof, including full groceries lines and general merchandise. Now, international supermarkets are very popular in china. There are many big supermarkets in the big cities in china and some of them are chain stores. You will be touched by the great variety of goods in different brands and you can have more choice. Furthermore, they sell good-quality products just like in our home country, which are much cheaper than other shopping centers in most cases. Commonly, food, commodities, clothes, books and electrical household appliances are all available and credit cards can be used. There are a lot of large domestic and international companies in China’s supermarket and hypermarket industry such as Wal-Mart, Metro, Carrefour, Trust-mart, Tesco, Lotus, Lotte Mart, RT-Mart, Yonghui, Renrenle, Hualian, E-mart, Isetan, Jusco, Park ‘n’ Shop, Spar and Watsons. Most of these chains have shares held by foreign investments. As the leader in this market, Lianhua has established a complete goods sourcing network and the first intelligent distribution center in China. Hualian has its main business in North China and Mid China, but it is now expanding its business in Southeast China in cities such as Shanghai. RT-Mart, the Taiwanese brand which has 101 shops in mainland China, centers its business in East China. 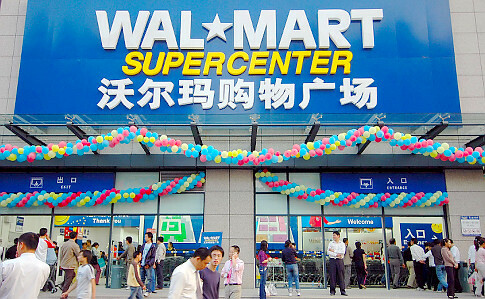 Wal-Mart’s main market lies in south China and southwest China, and coastal regions such as Jiangsu and Zhejiang. 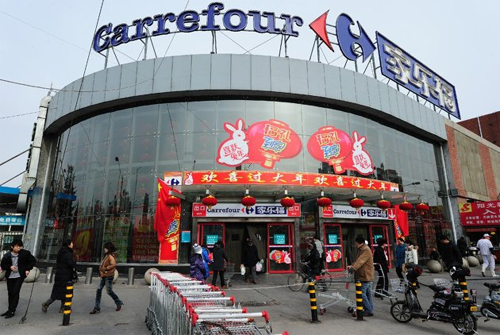 Carrefour now operates shops in over 14 provinces and cities in China. Most of its shops are located in relatively developed provinces such as Guangdong, Shanghai, Tianjin, Beijing, and Jiangsu. Smaller scale supermarket chains are also frequently seen in China. Most of these are local, and their business are limited to a certain geographical regions. For example, the Shanxi province has its domestic chain supermarket brand, ‘Meet All’. These supermarkets has attractive selling points for its customers such as; getting what you need with a single purchase; super-low prices; fresh products; self-selection and free parking. Among these five, the super-low prices and fresh goods make it the most competitive. Their competitive advantage comes from its reasonable prices, clear allocation of goods it stores, and limited waiting time for customers in line to pay. These factors all cater to the needs of its target customers as well as mid income consumers around the age of 30 or above.